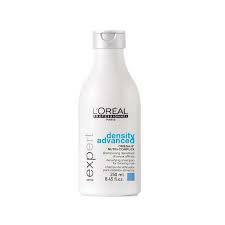 Densifying shampoo- Formula enriched with vitamin PP, B6 and with OMEGA 6 Nutri-Complex to help nourish the roots, helps restore vitality and give the feeling of renewed density to thinning hair. Ideal for use with the Aminexil Advanced anti-thinning hair programme. Spread evenly through wet hair. Lather. Rinse thoroughly. Repeat if necessary. In case of contact with eyes, rinse immediately.